Can you identify this Roland Garros dark horse? He is an impressive 15-5 so far in this year’s clay-court swing, including ATP World Tour qualifying and main-draw matches. During the run, he has defeated seven Top 50 players, including four in the Top 20 and two in the Top 10. He reached the final at the Barcelona Open Banc Sabadell, an ATP World Tour 500 event, but is still yet to celebrate his 20th birthday. He is at a career-high No. 39 in the ATP Rankings, so he is not yet on most people’s radar to go deep at Roland Garros. That needs to change. He is the in-form 19-year-old Greek Stefanos Tsitsipas. An Infosys ATP Beyond The Numbers analysis of the #NextGenATP star on clay this year reveals that he is already serving at a Top 10 level. He is ranked 10th best on Tour in 2018 on the red dirt, holding serve 85.37 per cent (140/164) of the time. In comparison, No. 1 Rafael Nadal is holding serve 87.12 per cent (142/163) – just 1.75 percentage points higher than the Greek teenager. When the big points have rolled around on serve, Tsitsipas has handled the pressure of break points extremely well on clay this season, saving 68 per cent (51/75). This has him ranked 14th best on clay in 2018 in this important category. Tsitsipas has directed most of his first serves out wide on clay this season in the Deuce court, making 55 per cent wide, eight per cent at the body and 37 per cent down the T. Even though the wide slider goes to the typically stronger forehand return, it pulls the returner off the court, immediately creating a big hole to the vacant Ad court to direct an aggressive Serve +1 forehand. The other smart strategy Tsitsipas has employed when serving wide in the Deuce court on clay is to actually let the returner recover back towards the middle of the court, and then hit behind them. 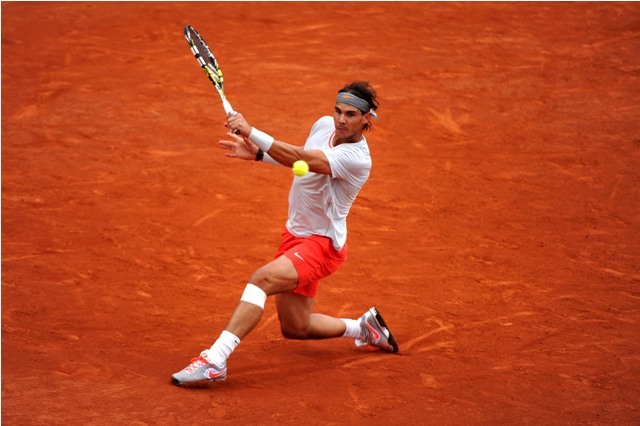 Playing behind on clay works better than hard court, as players can’t stop and change directions nearly as quickly. What Tsitispas must improve this week at Roland Garros is to break serve more often. He is just 43rd best on clay this season with Return Games Won, at 25.95 per cent (41/158), according to the ATP Stats LEADERBOARDS, powered by Infosys Nia Data. His two best wins this season on clay were defeating then-No. 7 Dominic Thiem 6-3, 6-2 in the quarter-finals of Barcelona and beating then-No. 8 Kevin Anderson the next week at the Millennium Estoril Open 6-7(3), 6-3, 6-3. This time last year, Tsitsipas was ranked No. 205 and battled through three rounds of qualifying at Roland Garros before falling in the first round 7-6(5), 7-5, 6-4 to Ivo Karlovic. Tsitsipas played an ATP Challenger Tour event both before and after Roland Garros in 2017. What a difference a year makes. This year, his lead-in form suggests he may very well be around in the second week of Roland Garros, where anything is possible. British number two Heather Watson has echoed comments from Johanna Konta in criticising British media coverage of her. Watson had only won once this year before a win in the first round at the French Open on Monday. She said she understands why British number one Konta said the media does not “make it easy”. “I try to stay as positive as possible because the media isn’t always the most positive,” Watson said. “I try to blot it out and ignore it because the opinion of the media is not important. “As long as I know what I’m doing and as long as my team knows, I try to stay positive. Watson, 26, reached the French Open second round for the sixth time after breezing to a confidence-boosting win over home hope Oceane Dodin 6-3 6-0. Konta seeded 22nd, was beaten 6-4 6-3 by Kazakhstan’s Yulia Putintseva on Sunday – her fourth successive first-round loss at the tournament. She has never won a main-draw match in Paris. Heather Watson reached the French Open second round for the sixth time after breezing to a confidence-boosting win over home hope Oceane Dodin. The British number two had only won once this year before Roland Garros, but impressed in a 6-3 6-0 victory. Watson, 26, dominated the match as Dodin wilted, although she stuttered slightly in a marathon final game before taking her fifth match point. She will face 16th seed Elise Mertens or American Varvara Lepchenko next. Belgium’s Mertens led 6-7 (9-11) 7-6 (7-4) 3-0 before the second day’s play was cut short by heavy rain in Paris and postponed until Tuesday. “I came out a bit nervy and once I got that out of me I was on fire and played really well,” Watson told BBC Sport. “That’s the best I’ve served in a match for a long time. “Serving out was tough because it was raining and you could feel it getting harder. You want to get it done but also not rush. In the build-up to the second Grand Slam of the year, Watson had said that she had not paid attention to her run eight successive defeats, saying she was only hearing of it through social media. That sequence ended with a victory in Nuremberg last week, with Watson adding before her opener against Dodin that she felt she was “not playing badly but things are not clicking”. With a vociferous British backing behind her, despite playing against a home player, Watson’s words rang true as she produced her finest performance of the year. Watson, now ranked 80th in the world, lost her opening serve to trail 2-0 but fought back strongly to take the first set in 34 minutes. She sensed Dodin’s vulnerability as the French world number 139 refused to change her wild-hitting approach, taking the momentum into a second set where she swept her opponent off court. The only minor blip in an excellent performance came in what proved to the final game, when she failed to convert four match points – and staved off four break points – in an agonisingly long deuce. With rain starting to fall in Paris, Watson saw the job through, winning 84% of her first-serve points and hitting nine aces in the match. She says the victory over Ukraine’s Kateryna Bondarenko in Nuremberg lifted the pressure of her losing streak and allowed to play more confidently against Dodin. “I was so pleased to get through that match against Bondarenko because there had been this losing run, which I hadn’t even thought of until everyone started writing about it, then that started to play on my mind,” she said. Watson became the second Briton – after Cameron Norrie in the men’s draw – to reach round two, and will now be seeking to reach the third round for the first time. Compatriot Johanna Konta lost her first-round match on Sunday, while British number one Kyle Edmund is set to open his campaign against Australia’s Alex de Minaur on Tuesday. Heather should be really proud of herself. She stuck in there. It came down to first-serve percentage. When she settled down, she played really well. She was so composed and read the game well. She did a great job of forcing Dodin to go for too much and took advantage of her weakness of her movement. Argentina’s Marco Trungelliti made a late dash from Barcelona to Paris to take on Bernard Tomic in the French Open & was rewarded as he beat the Australian to make it to round two. World No. 155 Jaume Munar provided a vision of Spain’s tennis future on Monday at Roland Garros, landing the biggest victory of his career in a battle of the generations. The 21-year-old, in only his ninth tour-level match (3-6) and just his second at a Grand Slam championship, knocked out David Ferrer, a Spanish tennis legend of the past 15 years. Munar recovered from an 0-2 sets deficit and 3-5 in the deciding set to beat 2013 finalist Ferrer 3-6, 3-6, 7-6(3), 7-6(4), 7-5 in four hours and 15 minutes for a place in the second round. Former World No. 3 Ferrer, who was competing at Roland Garros for the 16th straight season (44-16), had never before lost in the first round in the French capital. It is the highest-ranked victory of Munar’s career, in a completed tour-level match, following wins over Guillermo Garcia-Lopez at the 2015 German Tennis Championships (1-2 ret.) and Joao Sousa at last month’s Barcelona Open Banc Sabadell (6-4, 3-6, 7-5). Munar is currently the 13th-placed player from Spain, which boast nine in the Top 100 of the ATP Rankings. The 2014 junior Roland Garros finalist will next challenge No. 20 seed Novak Djokovic, the 2016 champion, in the second round. 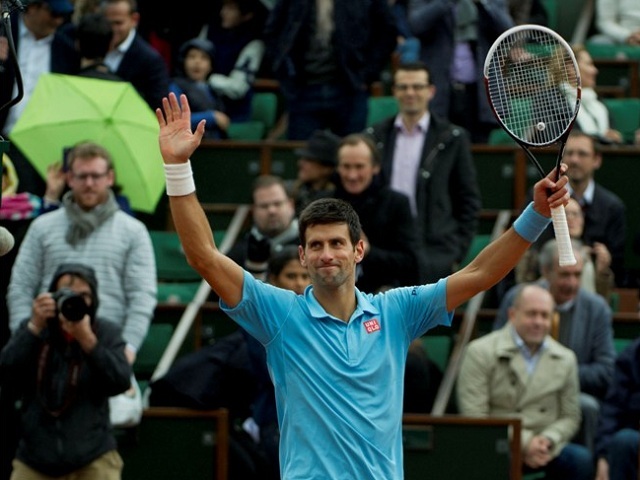 Novak Djokovic made the second round of the French Open after beating Brazilian qualifier Rogerio Dutra Silva. The former world number one, seeded 20th at Roland Garros, went 2-0 down at the start of the first two sets but recovered to come through 6-3 6-4 6-4. The injury-hit Serb, 31, has not won a Grand Slam title since his victory in Paris in 2016. Meanwhile Stan Wawrinka, another former champion who has struggled with injury, lost his opener. The Swiss 23rd seed, who overcame Djokovic in the French Open final in 2015, was beaten 6-2 3-6 4-6 7-6 (7-5) 6-3 by Spaniard Guillermo Garcia-Lopez. World number 12 Djokovic said before the tournament that his confidence had been knocked after suffering a recurring elbow problem, which required surgery in January. He returned to training in March and fell to successive first-round defeats at Indian Wells and the Miami Open. But the 12-time Grand Slam champion reached the semi-finals of the Italian Open earlier this month and looked fairly comfortable against Dutra Silva, the world number 134. The Brazilian got off to the best possible start by breaking his opponent in the opening game, before Djokovic got into his stride. Dutra Silva had his opponent rattled in the third set after they exchanged breaks, and Djokovic slammed a loose ball against the advertising boards in anger before apologising to the crowd for his reaction. In the end, the Serb brought up three match points and served it out at the second attempt. What's A Typical Day Like At Roland Garros? What’s A Typical Day Like At Roland Garros? I get asked all the time what day-to-day life is like as a player, what I do to prepare for events and what I eat. So now I’m going to answer all those questions that my friends, my fans and journalists have about a regular day on the ATP World Tour. For some background, I’m getting ready to make my eighth consecutive main draw appearance at Roland Garros. My opening round match is just a few days away. (No. 31 seed Ramos-Vinolas faces Mikhail Kukushkin on Monday). 6:30 am: My day begins. I get up and prepare a breakfast with gluten-free products. I’m not a Coeliac (a person with an autoimmune condition that affects the small intestine and must avoid gluten), I just feel better not ingesting gluten, milk or eggs. We’re sticking to a simple menu this morning: lots of fruit, turkey on bread, and a little rice for the carbs I’ll need ahead of a long day. 8:30 am:I leave the apartment I’m staying at and get to the Roland Garros grounds via the tournament’s official players’ transport vehicle and begin my daily warmup routine. 9 am: By this time I’m exercising at the facility’s gym and completing my joint stretches so that I’ll be loose when I step on the court for the first of two practice workouts I’ve scheduled for the day. 9:30 am: I’m on Court 5. My practice partner today is Benoit Paire. After a somewhat short but intense practice session, we take a selfie together! It’s just a fun way for us to look back and remember the moment. 12 pm: I take a shower and get ready for a Q&A session with the media. By 1:30, it’ll be time for lunch. Today I’ll have gluten-free pasta with chicken as fuel ahead of my second workout of the day. 4 pm: I’m back out on the practice court. This time I’m booked to train with Fernando Verdasco for an hour. Afterward, I take some pictures with my coaches, Jose Maria Diaz and Juan Ros, and also some with Fernando and his coach Guillermo Alcaide and his physiotherapist/physical trainer Javier Bustos Hernan. 6 pm: I’ve done all the work I’ve had to do at the club, so now it’s time to head back to where I’m staying. Before I get there, though, I have to make a stop at the supermarket. This year, my team decided not to stay at the players’ hotel; we rented an apartment so that means we have to cook and prepare the meals ourselves. 8 pm: It’s dinner time! We’ve made salad, along with baked chicken and rice for the last meal of the day. 8:45 pm: My physiotherapist stops by the apartment to provide general treatment and get me ready for tomorrow. Today was a long day and I can use the rest. I’ll be in bed and call it a night by 11.